Nordic Walking is a great way to get fit and challenge your muscles, bones and cardiovascular system. This Nordic Walking guide will help you choose the type of Nordic Walking pole that is right for you, identify the handgrip you want for your pole, and decide whether you should use Nordic Walking straps or not. In addition to the items mentioned above, I will cover the pole adjustments (such as Nordic Walking pole length) that ensure that your Nordic Walking experience is fun, pain free, and effective for your particular needs. I will also cover how to use Nordic Walking sticks properly and the health benefits of Nordic Walking. Let’s get started. I am not going to cover every single type of pole that we see on the market today. Instead I will present some of the more common and popular styles of Nordic poles. There are just too many Nordic Walking poles out there to cover them all adequately. If you follow the guidelines I present in this Nordic Walking guide, you should be able to find the Nordic Walking poles that are right for you. I recommend that you look for an easy way to adjust the height of your Nordic Poles. This is really handy if you are sharing poles with somebody else or, if you are like me and provide Nordic Walking instruction and you frequently change the pole length to introduce different poles to your clients. It is important that you identify the type of adjustment mechanism you prefer to adjust the height of your pole. Quite a few Nordic Poles have a click-and-lock mechanism to make your poles shorter or longer in height. Another type of Nordic Pole height adjustment mechanism is a twist-and-lock. With the twist-and-lock, you have to loosen the connection by rotating the pole components in opposite directions, adjust the length, and then based on the arrows that are indicated on the pole itself, lock it back in place. The issue I have with the twist-and-lock rotational mechanism is that a lot of clients do not have adequate grip strength to securely tighten the pole connector. If the connection is not secure, there is a risk that the pole will collapse when you put weight through the pole. One option to ensure the connection is secure is to take the head of the pole and to place it between your feet, grip it really tight by stepping on the grips, take both your hands, and use the leverage you gain to tighten the pole connection. How easy or hard it is to secure the connection mechanism depends on the style of the pole grip head. Some grip heads have a flare shape to them. That allows you to get your feet on either side of the flare and hold the pole in place so they can really get a good rotation on it. A couple of points to consider. First, when the weather changes to winter, the metal will constrict. If you tighten the connector during the cold weather months, you might find in the spring that the metal has expanded to the point where you are unable to loosen the connector. Oops! Second, if you’re still not getting quite the twist you want, garden gloves or any type of rubber glove will really help you to loosen and tighten the connection. Nordic Poles can collapse into different lengths. This is really handy, actually essential, if you travel to far off places with your Nordic Poles. There are some poles that come in a fixed, full length. They are often the lightest, more expensive poles, and wonderful to use, but very impractical to travel with because you cannot put them in your luggage. If you want shrink your Nordic Pole to a more manageable length when you travel, consider poles that are composed of three shorter segments and allow you to telescope. However, having said that, it’s important that when you return the Nordic Poles to their full length, that you make sure that the two poles are uniform in their length across all segments. In other words, you should readjust each part or segment of each pole to equal lengths. I have seen some clients bring me their poles and they’ve adjusted it to five inches on one side and two inches on the other and that doesn’t make for a stable a pole. In summary, make sure that all the parts are well-tightened and equally telescoped. The next thing to consider is the type of Nordic Pole hand grip that is best for you. Each manufacturer has chosen different materials for their hand grips. I have several Nordic Walking clients who are partial to a cork surface for their hand grip. They consider it breathable and comfortable. Other clients are quite comfortable with a rubber or plastic hand grip. It really comes down to personal preferences and you should select the material you feel comfortable using since you will be using the hand grip frequently. You will feel pressure through your hand from the hand grip as you push on the Nordic Pole. Your hand placement is important to get right especially for those of you with either arthritis or a weak hand grip. Let me explain further. In the video, around 6:34 minutes in, I demonstrate what I mean. When Nordic Walking with the Urban Pole brand of Nordic Poles, the hand grip pressure is through the outside border of your hand. In this case, the hand is in a very neutral position. That works fine for most people except for my clients who have arthritic issues in the wrist. The loading (or distribution of weight) in this situation can be a little bit uncomfortable. Some hand grips have a sleeve to accommodate your hand. These allow you to distribute the weight or load evenly. I have used them with clients who have weakened hand grips, whether from arthritis, missing digits, or neurological issues that affect the grip of the hand. A hand grip with a sleeve is a really handy way to solve this problem. A support sleeve allows you to place your thumb in and wrap the sleeve around your hand. Sleeves are identified with right and left on the sleeve portion in most Nordic Poles. If you decide to go with a pole set with sleeves, consider how easy it is to attach and remove the sleeves. Some sleeves are fixed in place and cannot be removed. The more cost-effective poles that have them often will not let you detach the sleeves (or release your grip from the pole) when you are using the poles. For me, that’s a big issue. My hands get really cold in the winter. If I use my Nordic Poles in the wintertime, it’s really important that I can easily detach from my poles without taking off all my warm clothing. Picture this: I’m a bundled up, I have my mitts on or my gloves on, I have this slipped into place with my mitts or gloves, and it’s not till the end that I go out and I clip the straps onto the poles. I also find it easier to have detachable sleeves because sometimes it is so cold that I can’t actually grip the Nordic Pole! It is important that the sleeves easily detach. Some Nordic Pole manufacturers cleverly put a little tag (or tail) on the Velcro strap of the sleeve so it doesn’t slip out. For most people, it is intuitive how to put your hand into it. Whereas, in other cases, as in the case of a Nordixx Nordic Pole, there’s no tag (or tail) and, as a result, it is easier to slip out. This is one more thing you have to consider when you make your purchase decision. When adjusting the fit of the sleeve, it’s important that you check, in the store or when you order the poles, that it fits and accommodates your hand. I am rather petite. This one here (the Nordixx pole) is very, very big on my hand despite it being a small size. I try to wrap it around, but I find it too big where my hand is to sit in the sling (or sleeve). As well, you should consider if you are able to adjust the length of the sling (or sleeve). With some manufacturers you can make the sleeve closer or farther from the pole using an adjustment mechanism. The LEKI click-on sleeve does not support the adjustable length. With some LEKI styles, you have a length adjustment that allows you to modify the distance your sleeve is from the pole. Other Nordic Poles have a sleeve system that is very similar to a standard cross-country ski pole, where you have the loop. Unfortunately, I often see the people using the loops incorrectly. When using your loops, you want to imagine that you’re reaching for a little bunny in a hole. You grab the little bunny ears that you see as you insert your hand in the hole. This will create a little hammock that you use when you push off. The pushing off happens behind you and is through the slings of the straps. Another point to consider when selecting poles and grips for yourself or the person that you love is that some of these hand grips can be confusing for individuals whose cognitive status is starting to decline. I bring this up because it was one of the first signs I had when my Mom started to get Alzheimer’s. She was a big walker and the concept of looking at the grip, figuring out where to put the hand in, and where to loop it was all very confusing to her. Another important consideration when selecting Nordic Poles is the ability of the poles to absorb and distribute shock. Specifically, if you have any issues with your wrists, elbows, or shoulders, evaluate how the design of the pole takes into consideration the ground impact forces. For instance, in the Urban Pole, there is a divot that shouldn’t be touched when adjusting the pole length. One of the jobs of this piece of rubber is to absorb some of the shock coming from the ground up towards your hand. The Urban Pole hand grip is designed to absorb impact away from your hand. In other designs, some of the forces from the ground are lost through the sleeve. Having said all that, it’s sometimes hard to decide which pole is best for you from a shock absorption point of view. However, I encourage you to try the poles before purchase. When trying any poles, if you hear a clanging sound or you feel a significant vibration occur, then you should not purchase those poles. Finally, consider the surface that you frequently walk on. Pavement will require more shock absorption than a soft surface. Your Nordic Walking pole length is important and you need to make sure that everything is set correctly for you. Make sure that the pole can be adjusted so that when you’re standing tall, your elbows by your side, bent at 90 degrees, and that your hand is setting or set to the grip of the pole. Whether it be resting on the outside or whether it be positioned so that your hands and the sleeve are resting, again, make sure it is at 90 degrees. This is the sizing technique for Nordic Walking pole length that I use for any of the types of poles, including the Activator poles. The only time I change it is that if I notice my clients don’t have a big arm swing in their Nordic Walking style technique. Because some Nordic Poles have a booty that sits on an angle, you want the pole to land on an angle. As you notice in the technique I demonstrate in the video, you land on an angle. If you don’t have a big arm swing, then you’re not going to have good interface between the base of the booty and the ground. That’s when I’ll often lower the height of the pole for clients until either they develop a bigger arms swing, or they just simply keep it at that height because that’s what’s comfortable for them. 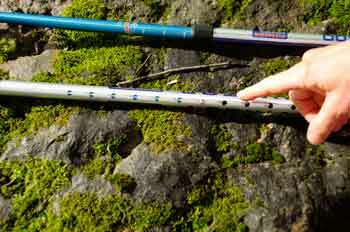 There are many things to think about when choosing Nordic Walking poles. Hopefully, this gives you some insight into the different poles and choosing Nordic Poles. Let’s cover Nordic Walking technique or how to Nordic Walk. I will break this process into four easy to follow steps. If you’ve never done any Nordic Walking before, the very first thing we do to improve our Nordic Walking technique is hold the poles mid-shaft. Relax them by your side. Make sure that they are feeling evenly weighted, and that you just have a very gentle arm swing. Then start walking with that arm swing. Ideally, you want to have opposite arm and leg as you walk and you swing through. I like to have my thumbs over the top of the poles in order to bring that arm swing through. Start exaggerating the arm swing. Imagine going forward and shaking someone’s hand. The would be the type of arm swing you are looking for with the poling. In every style of poles, you are going to lead with your thumb as you reach forward. Have that nice reach as though you are greeting somebody. You’ll notice in the technique that you will come back and weight-bear differently with the different styles of poles. Once you get used to the arm swing, start dragging the poles behind you. Don’t put weight through the poles just yet. Start with dragging the poles and getting used to the arm swing, with the poles following along. The third step is to put weight through your arms as you are Nordic Pole walking. Once you have that push through, it will allow you to get a better push off and increase your speed and your cadence as you Nordic Walk. The other thing that it will do is engage the muscles of your latissimus dorsi, or your oblique abdominals. You’ll feel your triceps start to engage. Nordic Pole walking brings the upper body into play when you start pushing down with an outstretched arm. The fourth step in Nordic Pole Walking technique is to increase your stride length and your push off. Doing that well comes with hours of poling practice. What are the health benefits of Nordic Walking? Here are four for you to consider. One of the health benefits of Nordic Walking for people with osteoporosis is that Nordic Walking poles provide extra support and point of contact with the ground for these clients. They get to enjoy looking around and feel less stressed about the potential for a fall. That extra point of contact with the ground allows you to focus on increasing your speed and enjoying a longer walk. The second health benefit of Nordic Walking is that the poles allow you to off-weight the joints. This is particularly important for clients with hip or knee pain and that might be getting some arthritic changes. Studies show that when you’re using your poles, it is a big advantage for arthritic knees because the poles reduce the load or demand on the arthritic joint. The Urban Poling Activator Poles can be used in rehabilitation when you are recovering from a knee or hip replacement. The bell-shaped tip allows you to easily offload much more weight than the standard Nordic poles. Often times, clients will exchange back and forth between Activator Poles and regular Nordic Poles as they go through different stages of rehabilitation. They might have used regular Nordic Poles prior to their surgery. Then we switch it to Activator Poles and then switch back to the regular Nordic Pole as their health and movement improves. Sarcopenia is a big problem in our society because people do not move as much as they should. It is the loss of muscle mass with aging. Sarcopenia does not have to happen, but unfortunately it happens a lot. 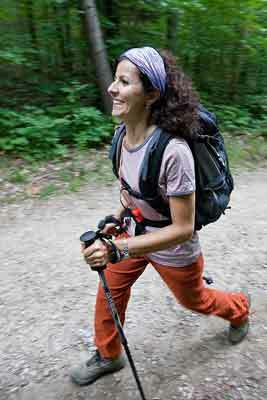 A 2016 study (1) looked at women with low bone mass who used Nordic Poles. After a 12-week intervention of Nordic Pole walking three times a week, these women had regained significant amount of muscle mass, improved overall function in terms of the ability to get on and off a chair, and to go up and down stairs. These are significant things that a simple piece of equipment can provide to your quality of life and the quality of your muscles and bones. One of the other health benefits of Nordic Walking is the activation of your back muscles when you’re pushing down and the activation of your core muscles. Nordic Walking is more than a lower-body or cardiovascular activity — it is a full-body activity. You incorporate the loading through the upper body and the co-contraction of the muscles, or the activation of the muscles in your core every time you push down. A study shows that if you do proper Nordic Walking technique with an outstretched arm, that you are going to increase the cardiovascular output similar to jogging. For those individuals that used to loved jogging but they can’t quite do so anymore, whether it be for any reasons, neurological or orthopedic, then Nordic Walking allows you to step up your game with your walking. You’ll burn more calories and get a better cardiovascular workout. I encourage you to consider the advantages and disadvantages of straps for your hand grips when choosing Nordic Walking poles. Nordic Walking straps have several disadvantages. First if you use Nordic Walking straps you have to spend time adjusting and fitting the straps so that they are comfortable. Second, Nordic Walking straps “tie” to your poles. For some people, that’s a concern for them because if you’re tied to your pole and you go to fall, chances are that, you may injure your thumb or your wrist because you’re not able to let go of the pole fast enough. Nordic Walking straps have several advantages over going strapless. First, Nordic Walking straps allow you to use poles without a strong hand grip. If you do not use Nordic Pole straps you will need to have enough hand grip strength to hold the poles throughout your walk. A grip strength test is often part of an assessment for many clients. I have written a blog post on the importance of grip strength and provided an exercise tutorial you can do to improve your grip strength. Second, if it is painful to load your hands while using your Nordic Poles, I recommend that you use Nordic Walking straps to reduce that load. An advantage Nordic Walking straps have for people subject to hand pain is that it reduces the load demand and you still feel like you’re always in control of your pole. These are advantages and disadvantages of Nordic Walking Straps. I think you should use what works best for you, what you feel most comfortable with, or follow the recommendations of your healthcare provider. A lot of my clients have both arthritis and osteoporosis. I tell these clients that Nordic Walking will allow them to walk much further than they could without the support of the poles. In addition they will get a greater number of bone-building steps behind them when loading. When you offload your joints you also offload your bones. For those that want to put more load through the bones, they could wear a weighted vest as long as their posture is kept in upright position. When it comes to posture and Nordic Walking, I see many people who improve their posture with the poling because they are pushing down and they are getting an equal and opposite force going up. Nordic Walking, in this case, helps lengthen, or what we call the axial elongation, the spine when walking. The weighted vest coupled with Nordic Walking (with perfect posture) is a winning combination for osteoporosis. Wearing a little backpack when Nordic Walking allows you to accentuate an improved posture even more. Oftentimes when you use your poles for commuting in the neighborhood, it’s nice to have a little pack to carry things. I picked this pack specifically because it acts very similar to the weighted kypho-orthosis. The straps come right across my shoulders. You’ll see that in a lot of posture braces and it encourages an open shoulder. I wouldn’t want to do a lot of poling with this because, as you might notice, it impinges in the front of the shoulder. But if you’re doing short distances, this is really a nice way to just open things up. Notice how the pack rides high, and the weight sits just below my shoulder blades. That encourages a more even lift of the spine. If you do have a tendency to be rounded, I would not recommend the weighted vest, but I would recommend a little pack that allows you to be drawn equally behind you. This will counter balance the forward kyphosis. My clients that have kyphosis find this arrangement very helpful and I hope you will too. Happy Nordic Walking. Don’t Nordic pole all have a kind of glove-strap making them different from a regular walking stick? Where can we buy them? I have look around in Ottawa and Gatineau for the last 2 years and they are impossible to find.mi want a good quality pole and I am ready to pay for that. My poles (Exerstrider ) are marked with suggested lengths for individual heights. That adjustment is way off from what I measure in the 90/90 position you show. Is it common that the suggested lengths don’t match up with the actual measure?